I hope you have had a great week. Often, when it’s a holiday week, our lives are busier (especially when spring break time means that children are underfoot!) I hope you have a moment of quiet during this Easter weekend to soak up the goodness that makes this celebration like no other! 1. A tweet, text, or email can never replace a handwritten letter. 2. My yard: One beautiful tulip, and cheerful dandelions everywhere. 4. Favorite chapter books from childhood: The Boxcar Children. Yours? This entry was posted in Just for Fun and tagged church, Five Facts For Friday, holidays, special needs by katiewetherbee. Bookmark the permalink. 1. 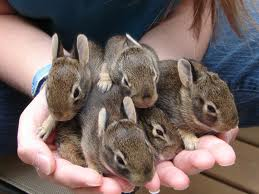 Those bunnies are cute! Happy Easter! Have fun celebrating the life we are able to live! Adrienne…I have NO idea what made me think of Tickle Deodorant. I was always jealous because my sister was old enough to need it, but I wasn’t! 🙂 Happy Easter, my friend.